This has been one crazy week! 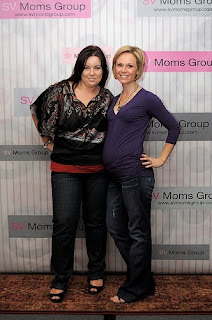 It all began last weekend when I attended the Silicon Valley Moms Blog LA/OC Event at the Ritz Carlton in Laguna Niguel. We were treated to wonderful and informative roundtables then got to meet a number of great family oriented companies. I'm working on individual posts about some of my favorite products I've been able to sample (one of which I've already got sponsoring a giveaway, stay tuned later this week because seriously this is a must have product for the busy mom). Above is a picture of Jen0r.com and I taken at the event.